It’s been over a week since my last entry. I sit facing an island that used to be a Venetian Fortress in Crete before it became the last leper colony in the 1950s. I face this island from my hotel room at the Blue Palace, in Elounda, Crete, Greece. It’s my third day in Greece. Having just come from Athens, And having just finished a stat at the Grand Bretagne, this island haven is a nice respite from the fast paced city life. I chill out after our group luncheon of salads and fish. Delicious fare as we gaze at moored boats in the harbor and take om the azure blue ocean. The weather today is a bit gray and threatens with light showers and a cooler breeze. I sit on my deck listening to a bit of Chopin to take full advantage of my deck, feel the breeze caress My skin and this cherished time carved out for me to write. I can’t waste another moment of writing opportunity. This time is precious to me and I grab it and hold it with great care. Others may wander and explore the resorts offerings, perhaps some at this very moment are taking in a spa treatment. But I, no- not I. I sit on my deck listening to Nocturne in E-Flat Major, Op 9 No 1 by Chopin. The breeze has become a bit more volatile. I sit in my nightgown and bathrobe provided by the hotel and enjoy my perch. The blue waters and some local fisherman boats bob before me. My own plunge pool sits unused, the waters are pushed by the winds which provides evidence that to dip my foot or even leg into the waters could prove chilly. So, I sit up here in my director chair and I lean onto the wooden table which overlooks the brilliant blue ocean and the islands beyond. So much to take in and so much to comprehend. I am sitting in a five star hotel on the island of Crete. Yes. Me. Sitting here listening to the wind, to Chopin, to the sounds of my Logitech keyboard doing it’s thing as my thoughts flow from my mind to my fingertips to the screen. At lunch, perhaps I indulged just a bit too much on the dry white wine from the region. To the point that I somewhat curse my dopey feeling as I consider the bed and an afternoon nap. It’s about three hours away from dinner with the group, more food, more laughing, more connecting with fellow travel sales consultants that primarily serve the luxury market. Only ten of us selected from around the country to participate in this Familiarization Event. My selection due to my agency’s high volume with the supplier; not my own – since I am fairly new with this agency. But the potential is there, for I have been fortunate to serve quite a few luxury leads passed along from our owner and others within the company that trust my background and my approach. I feel quite fortunate and blessed. I am learning so much already and anticipate the extent to which this knowledge will be used upon my return. All of this is surface, really. On a personal level, I find the geographic location is ideal for someone seeking respite from the touristy hot spots. The quiet of the bay of Elounda draws me in. I am entranced already. I could spend a significant amount of time in this very place, if I were permitted to do so. The brilliant blue waters are mesmerizing. The Rock as it appears in t he distance, strangely comforting in its historic significance. 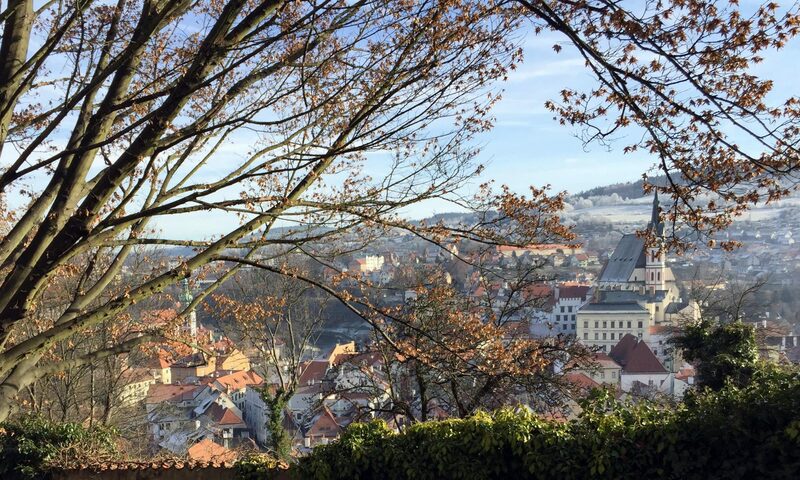 This whole country with its history dating back to well before Christ ..well, it’s enchanting. Even the chirp of the birds and echo of the wind seem different somehow. And, now, the heavy water pellets from the rain are dancing on my private balcony plunge pool waters. No different really than any other rain shower on top of a pool in any other part of the world. Yet- here it sounds and feels different to me. The plunge pool has been interrupted from its primary purpose- to sooth and hydrate and offer relaxation to guests. I need not enter the waters myself to receive such nourishment for my soul. I look at the drops bouncing into the pool waters and I rejoice at my own sense of merriment in this moment. Time for me. Time to feel the wind on my calfs, bare as they are under my nightgown as I sit privately drinking in this experience. Just me, my keyboard, the sound of the wind and the rain and the view of the island that at one time provided protection for this people of the bay. When I rejoin the group, I will learn of all the activity and accomplishment they have managed in our short three hour window of down time from the group schedule. And, I will secretly rejoice at the time I had to cherish on my own, on my deck, with the privacy of rock walls sheltering me from neighboring eyes. The palms down at the beach offering a metronome sway to the sound of the wind, and yet offering up their own tempo. I am grateful for the roof overhead on my deck which protects me from the now pouring rain. It’s not a burden. The rain soothes. And, I know, tomorrow will be a different day. Seventies predicted, sunshine and a chance to do some sightseeing. There is plenty of time ahead for that sort of busyness. No. Now, it is time to appreciate the window of quiet I have been afforded. 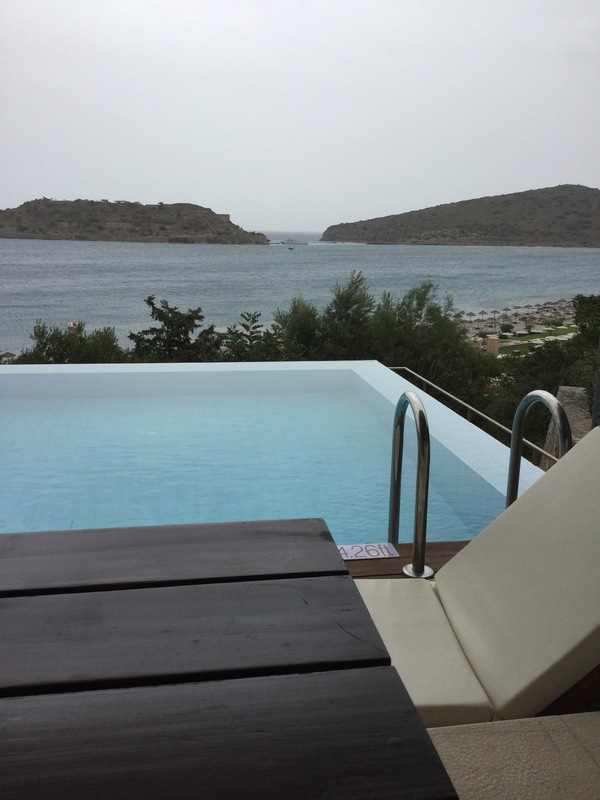 To cherish this silence interrupted only by the sound of rain drops pelting my recliner furnishings on the deck facing the Bay of Elounda. Previous PostPrevious See you in Santorini?